This year the festival falls on August 2nd, 2008 . 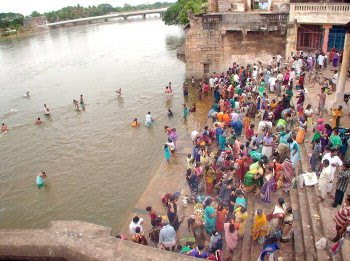 Hundreds of devotees, including newlywed couples, celebrate the `Aadi Perukku' festival by offering worship on the banks of the Rivers. The festival name translates as Adi (month) swell or 18th day swell because the waters of the Kaveri river invariably rise dramatically, often to the 18th step on the 18th day of the month of Adi, corresponding with the second or third of August every year. Perukku’ means rising – indicating the rising water in rivers. The festival is essentially a form of nature worship. Special food is prepared on this day and family and friends get together and pray for uninterrupted supply of water and a good harvest.. The river runs swiftly today. The water seems to be overflowing the banks. It is but natural. The increased water levels directly correlate with economic prosperity. This occasion is marked by offerings of chitrannam or rice cooked in different flavours,colours and ingre-dients to honour the river goddess and nature for life giving water. Goddess Kaveri is supposed to be in the third month of her pregnancy and like all pregnant women, she has a craving for delicacies. The baskets are laden with food which will be offered to the goddess as treats. There’s lime rice, tamarind rice, coconut rice, curd rice, sweet jaggery rice, appam, fried karudams, appalams and pickles. The menu for this festival is always variety rice. Thank you;) i too love puliyodarai. my husband &kids like thenga sadam.